Crack in the Earth: Greenland glacier loses ice island twice the size of Manhattan | Watts Up With That? It’s business as usual at the Petermann glacier, doing what a glacier does, calving ice into the sea. We reported on another chunk in 2010, four Manhattans in size. Borrowing from an oft used media ploy, at this rate, it will be down to ice cube size in ten years. I wonder though, if we’d ever have noticed any of this without MODIS? Keep that in mind when reading the claims. From the University of Delaware — An ice island twice the size of Manhattan has broken off from Greenland’s Petermann Glacier, according to researchers at the University of Delaware and the Canadian Ice Service. The Petermann Glacier is one of the two largest glaciers left in Greenland connecting the great Greenland ice sheet with the ocean via a floating ice shelf. Large concentrations of Gin and Vermouth have also been observed in the area. There was a lot less ice in Greenland when it was being farmed by the Viking settlers. That was in the 10th Century and they stayed there for a period of 500 years or so. The climate scientists need to find out what caused the ice to disappear all that time ago before they can reasonably discount such processes being in force now. For perspective, the, later mentioned, ice island that broke free from the Ward Hunt Ice Shelf, in (pre-CAGW) 1962, was 230-square-miles, so equivalent to 10 Manhattans, which is still 4 Manhattans more than the 2010 and 2012 ice islands combined. Maybe I’m just stupid but I think icebergs are nothing new. I mean, when have they ever not been in recorded history? I seem to have heard about one putting a dent into one of Man’s unsinkable things. Point being, these glaciers have been losing pieces of themselves since before Man noticed they existed. Those pieces have been replaced at the “top” and lost at the “bottom”. But now we have pictures. And ourselves to blame it on. If only those cavemen hadn’t learned about fire! If the terminus is now at a location where it was about 150 years ago, then this is not unprecedented, right? Seriously, though, this drives me nuts in news reports. First they say something is “unprecedented,” and in the very next sentence they’ll say that the last time it happened was such-and-such a date (generally in the ’30s or early ’40s, I notice). We really should have an “Alarmist to Sane” dictionary. Or a “When We Decide to Set The Precedent” dictionary? Abstract. Borehole PRGL1-4 drilled in the upper slope of the Gulf of Lion provides an exceptional record to investigate the impact of late Pleistocene orbitally-driven glacioeustatic sea-level oscillations on the sedimentary outbuilding of a river fed continental margin. High-resolution grainsize and geochemical records supported by oxygen isotope chronostratigraphy allow reinterpreting the last 500 ka upper slope seismostratigraphy of the Gulf of Lion. Five main sequences, stacked during the sea-level lowering phases of the last five glacial-interglacial 100-kyr cycles, form the upper stratigraphic outbuilding of the continental margin. The high sensitivity of the grain-size record down the borehole to sealevel oscillations can be explained by the great width of the Gulf of Lion continental shelf. Sea level driven changes in accommodation space over the shelf cyclically modified the depositional mode of the entire margin. PRGL1-4 data also illustrate the imprint of sea-level oscillations at millennial time-scale, as shown for Marine Isotopic Stage 3, and provide unambiguous evidence of relative high sea-levels at the onset of each Dansgaard-Oeschger Greenland warm interstadial. The PRGL1-4 grain-size record represents the first evidence for a one-to-one coupling of millennial time-scale sealevel oscillations associated with each Dansgaard-Oeschger cycle. We only know where Petermann Glaciers terminus was after 1875/76, because nobody was ever there to write about it before that time. The current terminus of the glacier is further back since it has ever been for the last 137 years. This is the entire observational record and the “unprecedented” refers to that time period only. We know not what it was before, that is, I can dream that there was no ice before that time and I can dream that there was ice everywhere. Either way, I have no data to confirm or deny either claim which is why I refer to this as dreaming. Please note that the terminus in 1875/76 was seaward from where it is now, so the current location is an absolute minimum since that time. If the industrial revolution and associated prosperity and economic growth has something to do with this current minimum location, I do not know, but this is not proof for either proposition. I do know, however, that air temperatures since 1987 have been warming at a fairly steady clip, but such warming has occured in the 1920-30ies as well, so the current higher air temperatures are NOT unprecedented. Furthermore, air temperatures are largely irrelevant for Petermann Glacier, because air temperatures cause no more than 10-20% of the melting, because the oceans below this ice shelf cause 80% of the mass loss. For the ocean in and near Nares Strait and Petermann Fjord we only have records since 2003 which is NOT a climate record from which to draw conclusions regarding local, never mind, global warming. When half of Manhattan breaks away and floats to Ireland, wake me. That would be news. I probably should have qualified my first comment on this thread. We went from 4 times Manhattan to twice in two years. Then consider Heinrich events that raft untold numbers of bergs towards the AMDO, and the signature sediments they produce. Combine that with emerging rapid sea level changes during the brief D-O events and consider viz-a-viz the present calving. They’re really missing the boat on this. They should say the ice is 8 times the size of Alameda island. Alameda could use the press, too. So what happened 150 years ago? The LIA was winding down but that had barely just started. Might it be that advances stop when everything is frozen solid and then start to move again when everything starts to thaw? That would explain why the snout was as long as it got since then. But if it is shrinking does that suggest things are cooling off and the melt and movement is slowing? What was that crap about Greenland and Northwest Canada warming 5 times faster than anywhere else ? How are they producing big icebergs if they are warming ? The ice pushes to the sea and then breaks off is my understanding. Oh , they extend their fake temperature readings to there and then figure them to the thousandth degree yeah yeah , I’m sure everybody believes that. Sounds suspiciously unmeasurable, but that doesn’t prevent a nice calculation with…wait…for it…two and a half hundredths of degree accuracy! Wow! Sure is Balmy! Its an assumption that warming temperatures are causing the melt. More likely in my opinion is increased solar insolation and surface particulate deposition decreasing albedo. Suprisingly, the nearby weather station at Eureka holds the record for the sunniest month in the world (May). This is a very sunny place in the Arctic summer. Just in time. Pour me a Glayva! Avec ice souvez plez! No but seriously, I don’t think I could care any less about the Arctic Ocean getting a bit more ice in it. This is a warming of 11 degrees Celsius per century. Can you really believe that? To clarify, the particulates are deposited as the ice accumulates and become embedded in the ice. When the ice reaches the point net ice melt occurs. It melts and sublimates from the top and previously embedded particulates accumulate on the surface decreasing the albedo and increasing the amount of solar energy absorbed. So these are primarily particulates from decades, even centuries ago. Any threat to shipping from icebergs yet? Such as the area where the Titanic sunk. I see nothing to worry about with this latest Greenland glacier event. “The Petermann Glacier is one of the two largest glaciers left in Greenland …” Weasel words, carefully chosen to enhance fears of CAGW etc. Just to put it into perspective, if the Greenland ice sheet was as big as Manhattan, then this piece that just broke off would be the size of half a football pitch. Send in some property developers, most of Greenland will be inhabitable soon! From the two images posted here it seems like the point of rupture in relation to the land is very similar to point where the Manhatten x4 chunck broke off. However, if we can expect the delta of ice on towards the right bank to break up in a similar way to the previous calving, the terminus would seem to have moved back about 5km. Also since the new break can be seen forming at that time, we can also estimate how far the glacier has advanced since the 2010 event: roughly 5km. So about half of area that has broken off is due to advancment of the glacier the other half is recession of the terminus. So it would be more accurate to say that the Peterman galicier has lost one Manhatten not two. Assuming that the advancment of the glacier has not slowed dramatically in this period (alarmists suggest basal melting should be accelerating not slowing advancment), the last calving would have been a loss of 4-1=3 Manhattens. The recession of the glacier is now about one third of what it was just two years ago. I spy with my beady eye…. which does NOT suggest warmer seas, but the opposite, and we know that glacier calving is not primarily caused by warmer air. 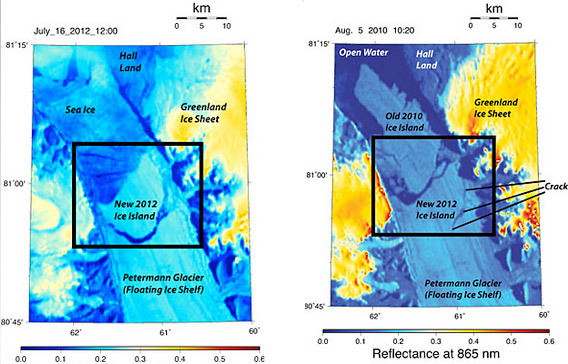 And and the ice shelf is now wider in 2012 with peripheral open sea areas to each side being reduced. It’s also appears that the land based ice sheet has withdrawn considerably between the two graphs shown but despite the reflectance scale being the same I note the colour code of that glacier itself has lightened considerably. The 2010 graph has a much wider range of reflectance values, both at the deep blue and the red end of that scale. Has someone been “correcting” the MODIS calibration in the mean time? Thank you for your courteous involvement here, at this blog. Your opinions will be politely received. Thanks again. In this Welsh view of the glacier (http://www.aber.ac.uk/greenland/Petermann.shtml) there are two adjacent pictures of the glacier taken in 2009 and 2011 which show the nature of the ice at the glacier terminus in late summer. The video points out that the ice loss is 25 times greater from the underside than the top, so changes in air temperature have a relatively minor impact (note also the snow-covered ground at either side of the channel – not a lot of melting there). Given that the glacier is effectively anchored at the two sides to the cliffs then I would expect flexing of the central portion due to tides, the weather and the fact that the body of the glacier is pushing forward at approx 1km per year to induce stress fractures which would lead to break up, but I have seen no discussion of these effects as contributors, simply references to temperatures of air and sea. As with all alarmist outpourings, there seems to be a lot of blinkered supposition here and not a lot of fact. Apart from the fact that 1962 cannot by any measure be called “pre-AGW”, you probably refer to the “Ellesmere Ice Shelf”, which was encompassing about 3,500 square miles (9,100 km2) has been in place for approximately 3,000 years until the second half of the 20th century, when it broke into 6 pieces, of which the Ward Hunt Ice Shelf was the largest at about 155 square miles (400 km2) in size. Ward Hunt itself remained stable until in April 2000, satellite images revealed that a large crack in the ice had begun to form, and in 2003, it was announced that the ice sheet had split completely in two in 2002. It’s been breaking up in smaller pieces ever since. I thought that summer brought an increase in iceberg numbers. Not a glacier, but an ice-shelf. Air temperature has very little effect on ice, its heat capacity is too low; water temperature can and does have an effect. In any case, glaciers transport ice to lower altitudes where it can melt, or in this case, float away. It’s what they do, part of the water cycle. Alarmists might just as well throw up their hands at rivers discharging into the sea – they’re doing exactly the same job, though at a much faster rate. The Peterman Glacier continues to advance. How about another Arctic sea ice update? If I’m not mistaken, the last time I read anything here was when the ice extent was almost equal to the average of the past decades. How is the ice doing now? Is it still recovering? OMG! We all need a drink. Manhattans anyone? As was noted by another commenter, the glacier has clearly extended further into the sea prior to the break off of the calf. Looking at the image, I had the distinct impression that it’s growing, not shrinking – oops my bad, couldn’t possibly grow with CAGW. Yes, but only 1/26th the size of Rhode Island – the gold standard in size-comparators. Global warming is inaccurate. And any climate scientist worth his or her salt knows it. That some other climate scientists use this tread-worn statistic speaks volumes and not well of them. There are many areas of the globe that are experiencing cooling. Are you saying they do not exist? Hmmm – the side-by-side images are slightly different sizes and unaligned at the bottom. The picture on the right needs to be resized in proportion to align with the bottom of the image on the left. Just a nitpik for whoever created it. I wrote “pre-CAGW” i.e catastrophic climate change. The warmists generally do not portray the 60’s as an era of climate catastrophes. Whereas now it seems that every extreme climate/weather related event is portrayed as a man-made catastrophe. I have no doubt this will be the case on the alarmisphere for this calving event. No “probably” about it. I drew my example and data entirely from the last paragraph of the above article (maraschino cherries etc, aside). I merely rephrased Bryants example in terms of Manhattans. I blame Greenland’s problems on the excessive use of helicopters and icebreakers by those studying it. If someone will give me a huge grant I will show a very strong correlation between the number of researchers/film makers/NGOs belching out CO2 in Greenland and the 0.11C+/-0.025C per annum temperature rise in the area. Sounds Titanic. Hope the vikings didn’t hit any during the medieval warming period. From your link it would seem that Greenpeace run part of the University of Aberystwyth (or use it as a means of controlling the research output of the relevant part of the university). Yes, Bob , I’ll take a manhatten. Definitely on the rocks with extra large ice cubes! 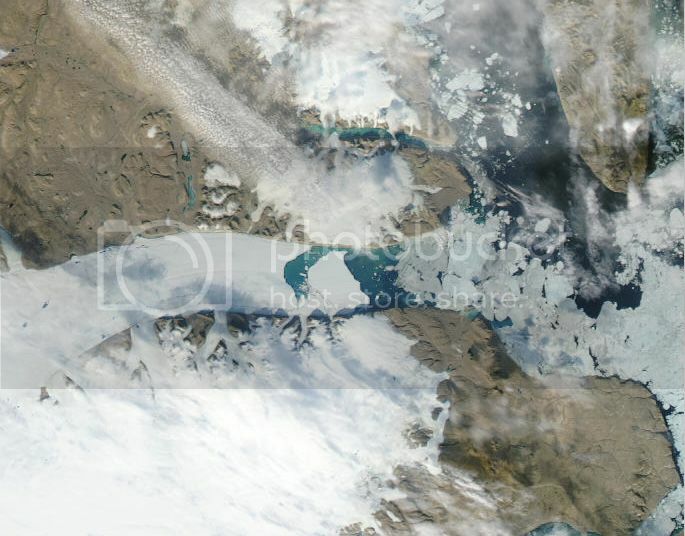 The Calving in 2010 occurred in early August rather than mid-July so the sea-ice in the mouth of the glacier had three more weeks or so to disperse in 2010. The partial crack which led to this break is apparent in 2010 and hasn’t advanced very much since then. That snow-covered ground is ~3,000 feet above the surface of the glacier. Mauri Pelto was writing about these effects at least since 2008 in reference to Petermann and other glaciers. Golly; soon it is going to be difficult to get ice in one’s Martinus, with only two really productive glaciers left in Greenland. This reminds me of the Telly Savalas headed gentleman writing a testimonial letter to the hair restorer company. What we need in this world is a better class of floating ice, instead of the rotten ice we have now. Somebody should figure out how to get glaciers to make prestressed ice, like the concrete used on road bridges. Then we wouldn’t have to worry about the floating ice cracking under tensile strain, when the tide flows in underneath it and lifts it up. Sorry, but that is false. Where did you get your arbitrary figure of ” 20 years or so” from? Unprecedented means “that which has never, ever happened before”. Period. If you want to say “unprecedented for the last x-number of years” then that’s fine. But “unprecedented” by itself means just that. See? That’s my point exactly — that according to the news media (and climate scientists), “unprecedented” means something that hasn’t happened in a few decades, which, of course, is not at all what it means. I know we’re supposed to put the [Sarc] tag on things like this, but I figured it was safe to leave it off since I pretty well explained the sarcasm in the second and third sentences. I did worry that someone might not get it, but I didn’t figure it would be you. Have a cup of tea. Things will be better. But if SST is the culprit the ice would melt from the bottom up, and break off through downward stress, in which case we would expect a low tide or high pressure to trigger it. I think we should set up LASARs and mirrors between the ice and geosynchronous satellites to cue us in on when these things break. We have the technology. All we need is better windshield wipers. And, therefore, they have no way of knowing what the previous max/min was prior to 1875. It could be that in 1775, there was no ice there at all. I feel the need to paraphrase the article’s first line: This is what glaciers *do*. They get thick in the middle from snowfall, then flow to the sea and pieces break off. Actually, something like this was tried during WWII. Those wacky Brits wanted to make an “unsinkable aircraft carrier”. So which King dictated that it should be “at least 20 years” or or so for that matter. I think “unprecedented” means there is NO precedent; as in it NEVER happened before. Okay. I know the sarcasm was quite clear enough for anyone able to read the full 75 words.of my comment. I’m just going to mosey on over to Comics Curmudgeon, where there’s a higher level of comprehension among its participants. Sorry I stepped in here. Actually, I didn’t say that; must have been somebody else; obviously someone who has never heard about my “Go jump in the lake.” experiment . which usually establishes firmly in the minds of the survivors, whether floating ice is melted by the air above, or the water beneath. In any case, the cause of the thinning is not relevent to whether the ice will break up at a high tide, or down at a low tide. The thickness (or maybe it’s the cube of the thickness) and the net pressure determine that; not which side of the ice sheet is thinner. Actually, if the ice mass were floating, then – regardless of which “side” of the ice were melting, the new mass of the ice (after melting and water runoff) would be less, the new “net mass point” of the floating ice would be balanced by the water it displaced,and proportionally equal amount of surface area would be exposed to both the sea water (below) and the air (above). But as the original author of the paper point out above, sea water below is the driving force of ice melt. IF – and IF the ice surface is changed to a darker level or color, or a rougher color and pattern so more sunlight is absorbed, then – practically regardless of temperature – the ice will melt away from above during the hours of sunlight exposure. at -4 degrees, but with all the available sunlight absorbed, the ice will disappear fastest. The disappearance will be from above if the ice shelf is fully grounded or on land. If at sea, the water below will still remove more mass than the air temperature difference between +1 degree and -4 degrees. Water below, at a 1000x greater density and a 10x larger coefficient of heat transfer across the boundary between ice and water compared to air and ice, will win out in the race to remove ice. 1. A warming trend of 1.1 +/- 0.25 degrees C per decade since 1987 does NOT imply 11 deg.-C per century. In my blog post presenting and discussing these data, I specifically point this out. The trends at Thule Air Force Base, Greenland (where records start in 1950 instead 1987) the trend is actually 0.24 +/- 0.12 deg-C per decade, or if I use Nuuk, Greenland (where records start in the 1880ies) that trend becomes 0.16 +/- 0.15 deg-C per decade. Only the last record starting well over 100 years ago can be extrapolated to 100 years, saying that Nuuk temperatures increased by 1.6 +/- 1.5 deg. -C over 100 years as the record is longer than 100 years. Note the uncertainties, they are large at 95% confidence, meaning that there is a 1 in 20 chance, that the true trend is within the +/- range. There is a 1:20 chance that Nuuk temperatures rose by more than 3.1 degrees over 100 years, but it is just as likely that the temperatures at Nuuk rose by less 0.1 degrees over 100 years. This is what confidence intervals mean and they are usually as important (I’d say more so) that the actual numbers given. There is no reason to believe that temperatures at any location should follow a linear trend, it is just an easy thing to do. 2. Nobody knows where the ice shelf was in 1770, but we know from air bubbles frozen into the ice what the atmosphere was like over Greenland at that time as well as 100,000 years back. These records show, that rapid change (anything in less than 100 years is rapid) is not only possible, but common. The associated changes have not always been kind and pleasant for living things at that time. 3. The reflectivities in the MODIS imagery I produced do NOT imply a climate change, because a different sun angle and a different angle of the satellite to the sensed location on earth will be received as a different “count” of light particles at the detectors aboard the satellite. I prefer to work with raw data (these are very raw), because fancy algorithms introduce fancy stuff that is easy to mis-interpret. The difference between ice, water, and land is a large signal where these angles do not matter. I identify features and patterns only, I make NO claims on absolute “albedo” or “corrected reflectivity” as some do who like to emphasize the drama of gloom and doom that they see even where it not as significant as they like the public to believe. 4. Petermann Glacier advances at 1 km per year, give or take a little. So, each year this glacier receives 12 km^3 of new ice that is 600-m thick where the ice, the ocean, and the bed-rock meet at what is called the hinge line. On average (NOT the last 2 or even 10 years, but the last 140 years), the glacier lost about 1 km^3 to calving (yes ice islands from Petermann have been seen in the 1880ies off Baffin Island, too), so the other 11 km^3 (if all is in balance) are lost by melting done by the ocean. 5. The ice islands that broke off are about 80-120 m thick, down from 600-m when they entered the fjord at the hinge line. I estimate that the 2010 event represented a loss of 22 km^3 (or about 2 years worth of supply) and the 2012 event represents a loss of 14 km^3. Uncertainties on these numbers are perhaps 30% because I do not know depth well enough. 7. Yes, I am vain … but we’d all off a little better, if we could chuckle at our shared vanities trying to proof or disprove global warming. Just saw: Sea Surface Temperatures are largely irrelevant with regard to the ocean melting of Greenland’s glaciers. What matters is the local temperature at depth (below 200-m say, for Petermann), not at the surface where it is almost always near freezing with ice present which in Nares Strait is almost always. The Arctic Ocean is warmest at about 200-400 m depth (salinity stratifies it). which of these four effects do you estimate to be most important for sea level rise, and why ? And an additional question : how much, assuming worst case scenarios for AGW and Arctic amplification, do you estimate the rate of sea level rise to be, due to reduction of the Greenland ice sheet by these four effects combined ? Or are there any other effects not mentioned in my list of four ? Well it seems that we are talking here about a glacier; which usually is a large river of ice sitting on the ground somewhere; in this case in Greenland, apparently around 81 deg North.. This river of ice, ends up flowing out into the ocean thereby creating a tongue of ice hanging out in the ocean from the land. The land typically has some relatively fixed altitude relative to say a mean sea level datum. On the other hand, the water in the ocean does not, and tends to rise and fall typically about twice each day. Free floating ice is hence free to rise and fall along with the ocean, maintaining a typical above and below surface buoyancy balance. The attached ice (to the glacier) has no such freedom to rise and fall along with the oceans, so it is subjected to upwards, and downward forces, due to gravity and the buoyancy pressure of the rising and falling ocean. Thus the attached tongue of ice IS NOT floating ice; but is like a diving board in contact with the ocean and it will flex up and down as the ocean rises and falls. The mechanics of a cantilevered beam is a well understood trivial problem, including such a beam with a distributed force loading. A term bd^3 comes into play in the determination of the strain that such a beam is subjected to and of course the length of the tongue (diving board) does too. Off hand I think l^2 shows up there somewhere. I’m not going to giggle the solution to the problem since anyone who is interested can do that themselves. I lost my copy of Timoshenko 51 years ago, so I can’t readily look it up, but I can simply derive it anytime I really want to know the answer. But I am quite sure that the answer doesn’t care whether the top of the diving board is thinner than the bottom, or which side the ice melted off; only the net thickness matters. And as I have said, anyone who doesn’t know which side sees the highest inflow or outflow of “heat”, can simply go and jump in the lake. Now in the two photographs, the right hand one shows floating ice; the left hand one apparently doesn’t. Yes George, there was an extra three weeks or so of melting and outwash in 2008 (Aug 5th). The ice island is making stately progress down the fjord as can be seen in today’s image, the sea ice is diminishing too. Andreas, your comments are much appreciated. Thank you! Well I don’t know what happened to the two low altitude photos I saw before, which prompted my comment; but perhaps the MODIS images are more revealing, since they appear to show that the most recent calving is a direct result of a fracture that happened back in/before 2010, when the cantilevered tongue was about three times longer, and hence much more able to cause the fracture that was still able to hang on until now. As near as I can judge, that whole area up to the current break, is clearly ungrounded ice, and I’m quite surprised that a tongue that long and skinny is even able to hang together. I think they are a bit loose with their description of the region as a “floating” ice shelf. The broken pieces are clearly floating, but the rest is not, since it is still attached to the land. The broken pieces are floating and sailing away. The attached piece is still floating also, well, almost all of it, anyways. The “floating” refers to the vertical plane, there is a line upstream towards the Greenland ice sheet where all the ice is in contact with the bottom vertically. This is called the hinge line. The attached floating ice shelf is now smaller (by 4 Manhattan’s in 2010 plus 2 Manhattans in 2011 minus, for giggles, 1 Manhattan for a steady rate of new supply added). The still large floating section of the glacier is attached to land on the sides, but it is not attached to the bottom. The walls are pretty close to vertical. The friction provided by the side walls is retarding, holding back the glacier which wants to move forward more than it can because of the retarding force of lateral (not vertical) friction. I think this is what glaciologists mean by back pressure, but I am no glaciologists and call it lateral friction. Think of the cork in a wine bottle, the push or pull you apply to get it in or out is the pressure gradient (that makes your boiler explode if the pressure inside is higher than outside) force. The friction is a force balancing this, holding it back. In a perfect balance between these two forces, the glacier keeps going at a constant rate (a body in motion without a net force applied stays in motion). Now, if you change any of these forces, acceleration or deceleration occurs. The removal of large segments that have provided frictional retardation may lead to accelerations. It is more complicated than this and there are always devils in the details, but this is good enough for now to perhaps address some of the confusion related to what is floating and what is not. The only part of this (or any) glacier that is not float is that part that is attached to bed rock (land) in the vertical, not horizontal directions. @Decker: My statement on air temperatures was refering to the mass balance of Petermann Glacier for which air temperatures are not important. Nowhere did I say, that air temperatures were irrelevant in general. I do stand by my statement that Sea Surface Temperatures are largely irrelevant (especially if measured by satellite) to ice-ocean interactions that almost always take place below top 1 mm of the ocean which are NOT, repeat, NOT measures by MODIS channels 31 or 32 at frequencies of 11 and 12 um. I am no glaciologist, so I am teachable on glaciers, but I have learnt a few things about the oceans over the years. Show me ocean data, ocean physics, and a good argument, then I may learn more (as I always do). As it stands, I see not such thing here, but like Greenland, things do change, some for the better, some for the worse. My point Andreas, is that truly floating ice is not too prone to break up; well not until it does a lot of melting. But any cantilevered tongue of ice, that happens to also be over open water, is subject to buoyancy forces, as the tides rise and fall twice a day; not to mention ocean storms, and since ice; like concrete is almost devoid of tensile strength, then any up and down flexure due to rising and falling ocean water, is bound to eventually crack the sheet, and with that super long tongue before the loss of the 2010 ice island, it is no wonder that it started a failure way upstream at what subsequently became the present 2012 breakoff. With the Antarctic peninsula ice shelves that everybody seems to have apoplectic fits over, you have the whole south Atlantic, and Pacific, sloshing back and forth under those shelves twice a day; no wonder the break off at regular intervals, when they get too far extended out over the sea. Got it. The crack or fracture or cantilever was present for for many years moving seaward with the glacier. This was the location people expected the next break, and it happened monday, a little earlier than I expected. Eric Rignot did some calculations on Petermann’s ice shelf in the 90ies as a beam that is flexed by the tides, I better read it again as I forgot his results. I think the hinge line moved vertically off the bed rock a few inches and a few 100 yards horizontally with the tides. These are not static, but dynamic environments with many moving parts that can give and take some stresses within limits. What these limits are, nobody knows, but perhaps we will find out. We already did see what happens when the hinge line becomes unhinged as it did 20 years ago at Pine Island Glacier in Antarctica. These are the type of worries I have with regard to Petermann Glacier. In dynamcis there often are multiple stable equilibria and a transition from one steady state to another will not be a “linear” response to forcing nor will “linear trends” be of any use to describe anything useful.